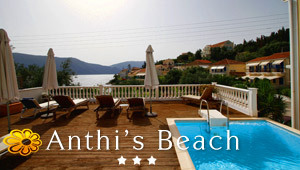 Emblisi Kefalonia: Far away from Argostoli lies Emblisi, one of the most beautiful beaches of Kefalonia. Very close to the fishing village of Fiskardo and 50 km from the island's capital, you will find this white pebbled beach known for its crystal deep bay and steep rocks scattered on either side acting as a unique sunbathing spot. This virgin landscape is well- maintained without tourist facilities and guests enjoy the natural beauty while swimming becomes quite an experience in the amazing green waters. Enchanting lush greenery and high trees cover the surrounding area and create an exotic atmosphere that attracts a great number of visitors. Emblisi is one of the main attractions of the famous Fiscardo village and it gets quite busy during the summer season. It is easily reachable through an asphalt road and there is a spacious car parking as well.